xplore the possibilities of using filters with your ultra wide angle lenses with the SW150 Mark II Filter System Holder from Lee Filters. This holder is designed to work with Nikon AF-S Nikkor 14-24mm f/2.8G ED, Samyang 14mm f/2.8 ED AS IF UMC, Sigma 12-24mm f/4.5-5.6 II DG HSM and Tokina AT-X 16-28mm f/2.8 PRO FX lenses. Each holder requires a purchased separately adapter consisting of a front ring, compression ring, and a locking ring. 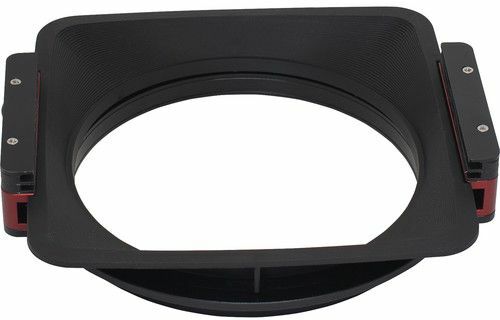 When fitted, these rings form a collar that remains on the lens whenever filters are used. The SW150 Mark II is compatible with the SW150 polarizer, Little Stopper, Big Stopper, SW150 neutral density graduated and standard filters. Filters slide into grooves on either side and may be stacked up to 3 at a time. Optional extenders may be added to for increasing the number of stacked filters, however this may result in vignetting. The holder rotates for controlling polarizing and graduated ND effect.